Following the country’s first democratic election in 1994 education was prioritised to transform a completely dysfunctional system that was a direct result of apartheid’s distorted policies. 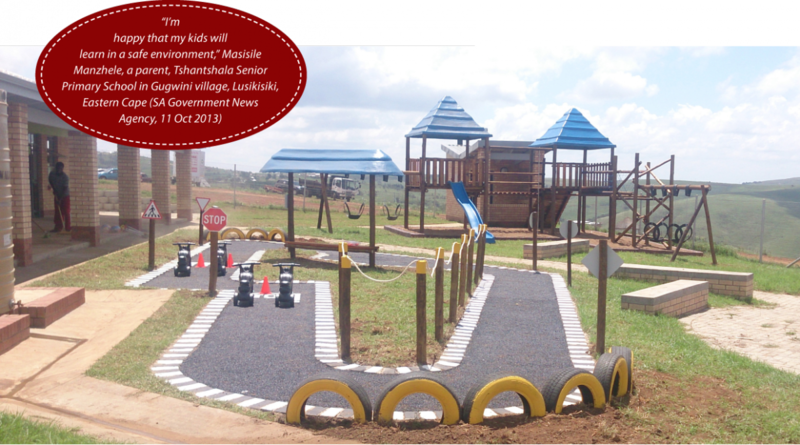 One area that was especially neglected was that of school infrastructure. 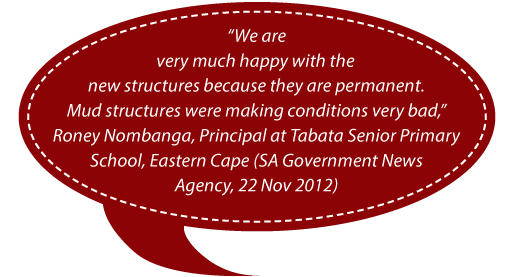 This resulted in numerous substandard schools and schools without basic services for the majority of South Africans. To address the backlog in services at schools and replace inappropriate school infrastructure, the Department of Basic Education launched the Accelerated Schools Infrastructure Delivery Initiative (ASIDI) in 2011. The programme reached its first milestone in October 2012 when President Jacob Zuma handed over 49 schools in the Eastern Cape. This year the Department of Basic Education reached another historic milestone with the handing over of its 100th state-of-the-art school. 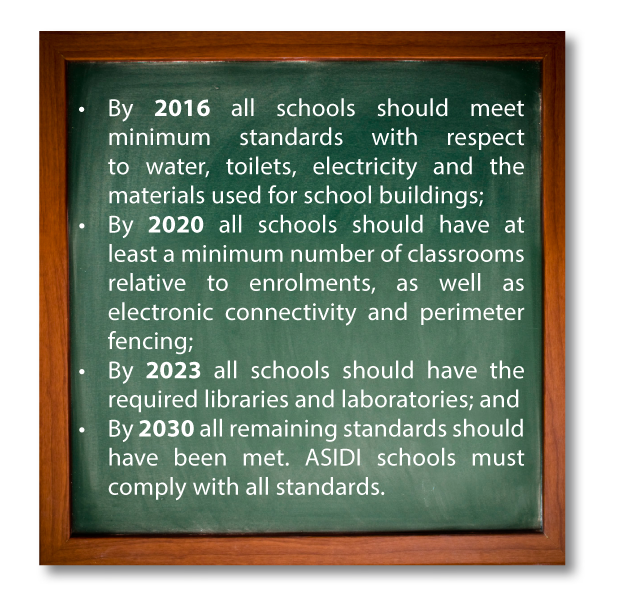 With each handover, government moves a step closer to reach the 2016 Norms and Standards for School Infrastructure target of all schools meeting the minimum standards it has set for water, toilets, electricity and building materials. More importantly, they provide our youth with centres of excellence which are safe and conducive to learning. The apartheid legacy of substandard education manifested itself in Bantu education, which systematically aimed to ensure that Black South Africans remained a source of unskilled labour for the economy. In the infamous words of then Minister of Native Affairs Hendrik F Verwoerd, Black South African’s were designated to be ‘hewers of wood and drawers of water’. The low standard of education was paired with inferior school infrastructure, which meant no access to water, sanitation or electricity. By the end of apartheid, 59 per cent of schools were without electricity, 34 per cent without water, 12 per cent without toilets and 82 per cent without libraries. For example in the former Cape Province (now Western and Eastern Cape respectively) the apartheid government built what were known as “plankie schools”. These schools were unacceptable to Black South Africans, and many communities, particularly in the Eastern Cape, resorted to building their own mud schools. Following the establishment of a democratic society, basic education was declared a right for all. This resulted in universal access to education. Government also started to eliminate school infrastructure backlogs which separated learners along geographical, economic and racial lines. The ASIDI programme gives effect to the Freedom Charter’s call: “The Doors of Learning and Culture shall be opened!” ASIDI is a R8.2 billion public-private partnership initiative and is funded through the Schools Infrastructure Backlog Grant (SIBG). To realise the 2030 goals of the National Development Plan, the Presidential Infrastructure Coordinating Commission (PICC) has implemented a National Infrastructure Plan which consists out of 18 Strategic Integrated Projects (SIPs). 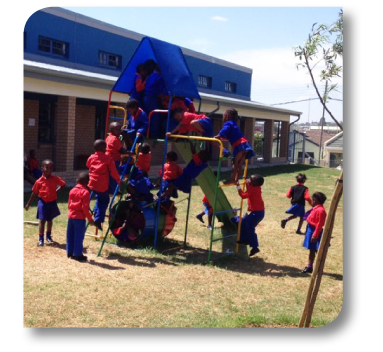 ASIDI forms part of SIP13 which focusses on the national schoolbuilding programme. All the various SIPs aim to strengthen the country’s socio-economic infrastructure which will improve service delivery and promote economic growth while simultaneously creating new jobs. The ASIDI project therefore not only brings hope and dignity to communities; but has also contributed to addressing unemployment as one of the main challenges that South Africans (62%) feel government should address (GCIS National Tracker, 2014). A total of 23 000 jobs were created thus far with ASIDI, most of which were in the rural communities. The programme also greatly contributed to skills transfer. For instance during the construction of the Dorrington Matsepe Primary school in Kroonstad,Free State, 455 local people were employed, of which 76 were women and 285 were young people. Also, all materials used were sourced locally. Each school is a state-of-the-art institution with resources to respond to the educational needs of a contemporary learner. They come standard with science and computer labs, nutrition and Grade R centres, libraries and administration blocks. There are dedicated staff rooms, principal offices, a sick bay and reception. 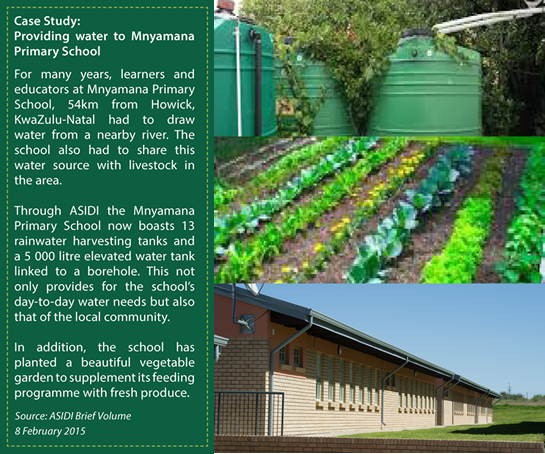 ASIDI ensures the dignity of learners by providing essential amenities. 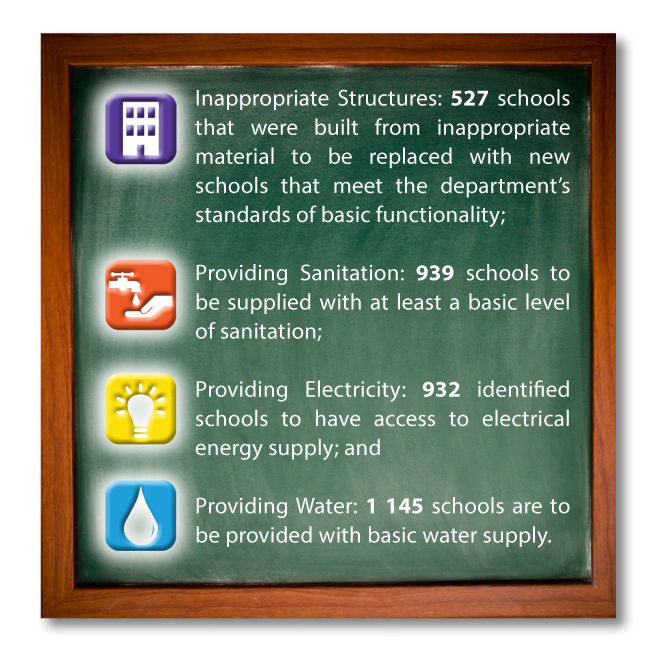 By the end of April this year 381 schools had access to water, 371 to sanitation and 289 to electricity. These critical services ensure the basic rights of learners are met and there is a safer and a more hygienic learning environment. 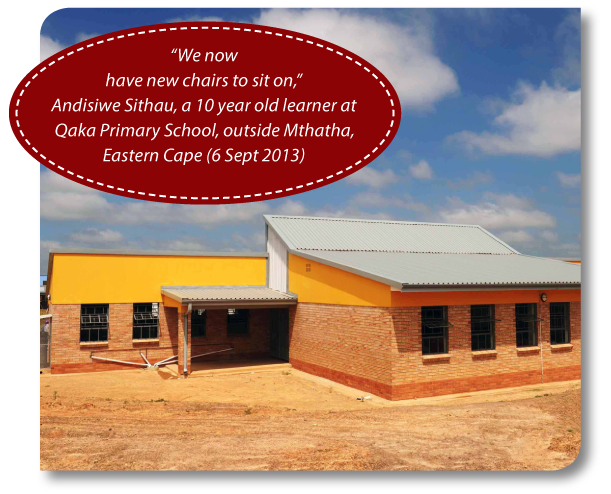 Moreover, the modern school infrastructure ensures better school attendance, especially in the Eastern Cape where school authorities had experienced an annual drop in attendance at mud schools during the winter months. The focus of the programme on mostly disadvantaged communities of the Eastern Cape, resulted in an increased positive sentiment within the province in 2014 (54%) as compared to 2012 (45%) on governments performance in building new schools where they are required (GCIS National Tracker, 2014). 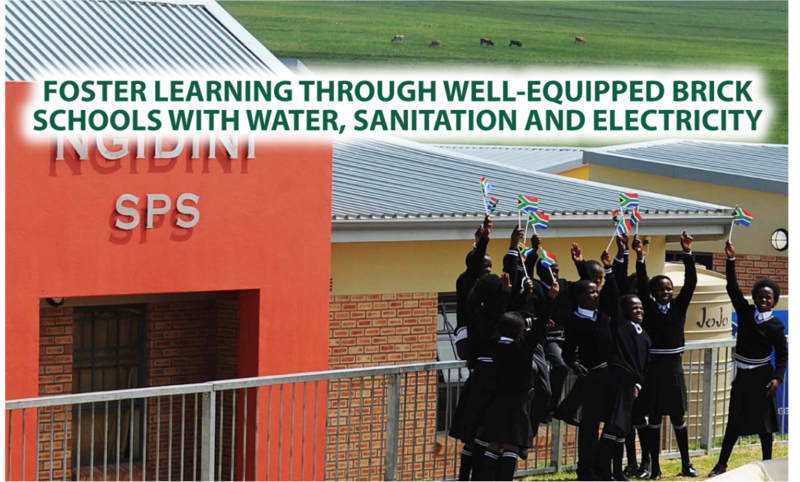 ASIDI schools do not only deliver a safer, more conductive environment for teaching and learning, but also provide rural communities with hope for a better future for their children. Although state-of-the-art schools greatly contribute the performance of teachers and learners, they are but only one of the contributing factors to a quality education. These schools equalise the playing field for children from poor and rural backgrounds giving them a foothold to a better life through world-class schooling infrastructure. 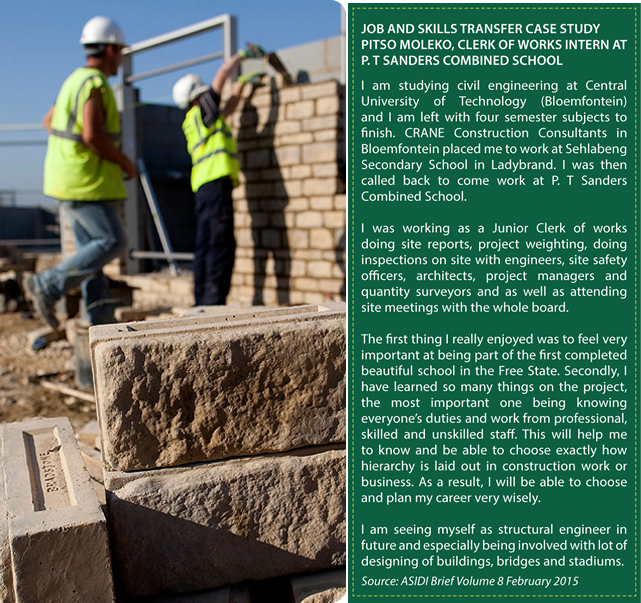 The building of ASIDI schools create rural job opportunities, ensures a transfer of skills and support local businesses.